Sigma is known primarily for lenses, but it also makes cameras. The most recent creation is the Quattro series. Like previous models, it uses Sigma's unique high resolution Foveon sensor. But this time around, some serious shape-shifting has been applied to the body for a truly oddball camera that is hard to come to grips with (literally). 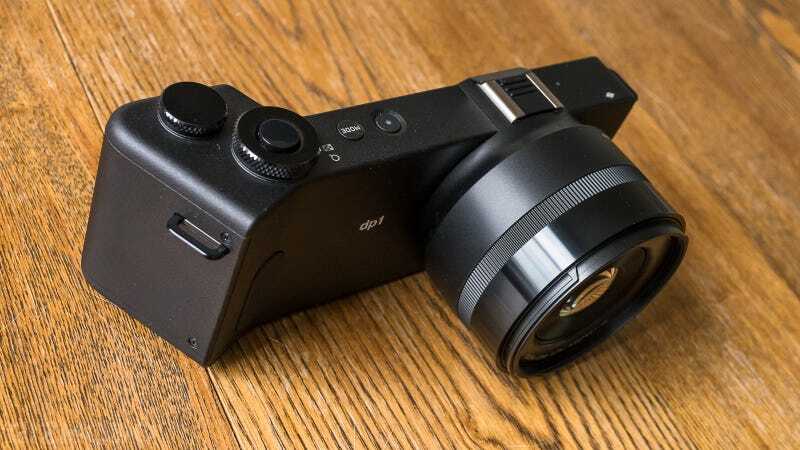 It's hard to know how seriously to take a camera like the DP1 Quattro. Historically, Sigma's cams have been bad in low light, slow to focus, and quite expensive. They only remain a spectacle because of the Foveon X3—a uniquely designed species of image sensor which stacks three layers of photo-sites that detect red, green, and blue distinctly, combining each signal to create the image. This is different from traditional bayer sensors which use a single pixel to record all the color wavelengths at once, requiring a filtering process to produce a final image. Basically what Foveon sensors add up to are more finely detailed pictures with stronger color depth. Having never shot with a Sigma camera before, I was excited to look at the gorgeous 29 megapixel images this thing was capable of. As an adherent to a strictly RAW diet, I was disappointed to see that only JPG mode can produce 29 megapixel images. When shooting RAW, you are limited to 19 megapixels. Oh well. But before I could even drown my sorrows, I had to wrap my head around the Quattro's shape. I can only ask myself, WHY? Why on earth Sigma decided to forge ahead with this body design is beyond me. 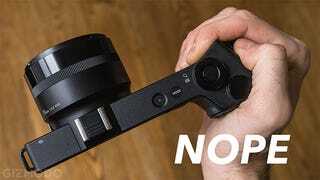 Where most cameras feature a grip that juts out in front of the body to fit in your clasped fingers, the Quattro's grip extends in the opposite direction: toward you. I spent a few minutes shuffling my hands around the thing, but couldn't figure out how this shape made sense. It's difficult to get any kind of purchase on the camera. This tragedy is compounded by the fact that the buttons and dials are actually great, sitting in logical positions with a nice and click-y tactile feel. But that grip—oh dear. I did find that when I flipped the Quattro upside down, the grip fit perfectly in my hand. Maybe a fudged design schematic made its way through the process and nobody had the gumption to admit to error. I can only hope, because its hard to otherwise justify such ergonomics! Despite the Quattro's shape, everything else about it is super slick. It's minimal, with a stationary display on the back and a pretty large 19mm (28mm full-frame equivalent) f/2.8 lens on the front. That's on the DP1 version. There is also a DP2, which is the same, but sports a 30mm lens (45mm full-frame equivalent). Shooting with the Quattro was easy to get used to, with logical menus and quick access to most controls. The biggest hurdle was speed, which it lacks any trace of. Shooting a single JPG image required a delay of about 15 seconds before you can play it back. Not even joking. There is about two seconds of lag between shots. Autofocus is also sluggish by modern standards, especially in low light. Needless to say, the Quattro is not for sports or even street shooters. These shortcomings could possibly be lived with but for one truly fatal flaw—low light. Like previous Sigma cams, the Foveon sensor just can't keep its bearings in the dark. You aren't going to want to venture past ISO 800 with the Quattro, or else you will find yourself awash in a sea of noise. For all these reasons, landscape photography is really where the Quattro shines. As long as you have a stationary subject with a tripod that will allow you to keep the ISO low by using slow shutter speeds, the images from the Quattro can be really fantastic. I got the best results sticking with the regular old 19 megapixel resolution. The Super-HI mode, which yields 28 megapixel JPGs, gives you pictures that suffer from some very jagged and compressed-looking noise patterns. It's not really a surprise, because the 28 megapixel resolution is the result of a rendering algorithm that essentially upscales from 19 megapixels. The regular, native resolution photos are much more natural looking. Visit our Flickr gallery to view the following images in their native resolution. The Quattro DP1's 19mm f/2.8 lens is great in the center, but the perimeter is not very sharp at all. Also, magenta fringing was rampant. That makes it very important to control the highlights with this camera. To make the most of the Quattro's image quality, the RAW images are where it's at. Even under ideal conditions, I still found that fine detail can get a little garbled, but most of the time I ended up with tack-sharp results. Unfortunately, you need to use Sigma's propietary ProPhoto software to read the RAW files, which hampers workflow if you are used to Adobe Lightroom or Photoshop. There's no question that the Quattro is an oddity, and it seems like it's that way on purpose, to make splash around the Foveon sensor which is a stunning technology but very limiting. It was sure interesting carrying it around for a while, but it was lovely to return to traditional camera bodies, the speed of modern auto-focus, and the ability to shoot in low light.